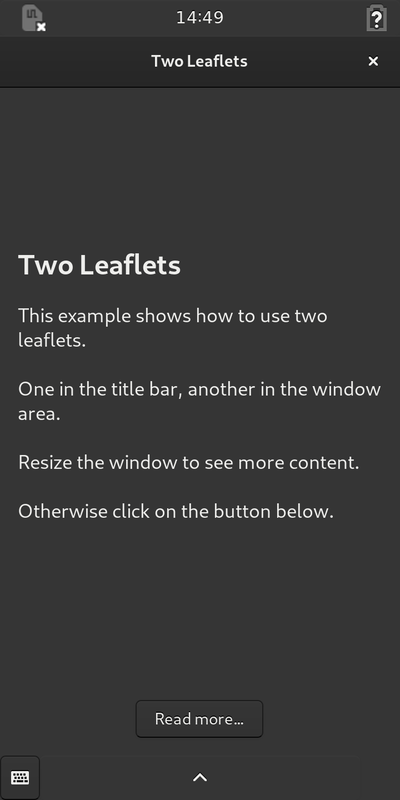 When run, the application described in this part of the tutorial shows a window with two leaflets. One is used for the title bar, the other for the window contents. When the window is resized or updated, the leaflets adapt and remain in sync with each other. The main source code for the application can be found in the main.py file within the src directory. The purpose of the other files is explained in other tutorials, such as Your First Application. We begin by looking at an overview of the window layout we want to create. On the left is a title above a left page containing a button. On the right is a subtitle containing a back button above a right page. When there is enough space to display both pages we want to hide the buttons; otherwise, we will show them so that the user can navigate between the pages. We will not show all the main program here. Instead, we will focus on the parts that have changed since the previous part of this tutorial. As well as providing features for adaptive user interfaces, these two leaflets also help us to structure the code. First, we create a leaflet to hold the components of the title bar, then we create a leaflet to manage the main contents of the window. It also contains a back button that is not part of the normal collection of window decorations, which we define separately. The subheader is allowed to expand horizontally to fill any available space – this causes the close button to be placed in the correct position when the window is fully expanded. This ensures that, for example, we do not see two close buttons when the window is expanded. We use a Gtk.Box to hold the label so that we can control its placement in the page. Both pages are created with their hexpand_set properties set to True. This allows them to expand horizontally if their child widgets require more space. Note that we use the same names to refer to the two pages as we used for the headers: left_page and right_page. This helps us to synchronize the two leaflets. We also want to make sure that each header is horizontally aligned with the content it is associated with. Because each size group is used in horizontal mode, these place constraints on the widgets in each group to ensure that their widths are synchronized. This ensures that the appropriate header is always shown in the title bar for the current page. It is also why we define names for the pages when we added them to the leaflets. This ensures that the buttons will only appear when the leaflets are folded. 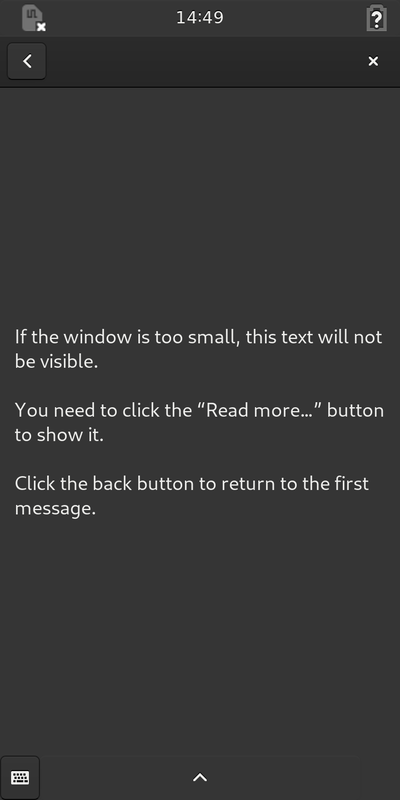 There is no need to show either of the buttons when the window is fully expanded. The connections only have an effect when the buttons are shown. It is not possible for the user to click them when the leaflets are folded. We assign a default size to the window to help inform the leaflets about the amount of available space to expect. Here, the page supplied as an argument is passed to the content leaflet so that it can be shown. Although we change the visible-child property to change the current page, the visible-child-name property will also be updated. This means that the property binding that we set up earlier will ensure that the title leaflet will also be updated, keeping the leaflets synchronized. This part of the tutorial showed how two Handy.Leaflet widgets can be connected together to ensure that the Gtk.HeaderBar shown in a window’s title bar is synchronized with the corresponding widget in the window’s main area. We add two Gtk.HeaderBar widgets to a leaflet in the title bar, and we add two Gtk.Box widgets to a leaflet in the window’s main area. Each leaflet is responsible for showing one or both widgets it contains, depending on the amount of space available. We use a Handy.HeaderGroup to manage the header bars, avoiding problems with duplicate window decorations, and we use Gtk.SizeGroup objects to keep headers and pages aligned and sized correctly. Each header bar is assigned a name using the title leaflet’s child_set method. The corresponding page is assigned the same name using the content leaflet’s child_set method. By binding the content leaflet’s visible-child-name property to the corresponding property in the title leaflet, we ensure that the two leaflets are synchronized. Two buttons allow the current page to be changed by updating the leaflet’s visible-child property. By binding the folded properties of the leaflets with the visible properties of the buttons, we ensure that the buttons are only shown when there is not enough space to show both pages at once.